Asking for donations is not something that comes naturally to me, even though I am a fundraiser! In fact, I still get scared. Whether it’s a one-on-one donation request or an appeal letter, asking for donations is a skill that I had to learn. Thinking about how I have improved (and conquered my fears), I was reminded of a discussion I had with the director of a Catholic non-profit in California. She had been hesitant when it came to asking for donations. She knew she had to ask but just kept struggling. Finally, after listening to her express her fears, I assured her that I could offer advice to help boost her confidence. Confidence is essential when it comes to fundraising. You can have a long list of potential donors – who are ready to give – but if you don’t have confidence, you probably won’t be able to ask them for a donation. 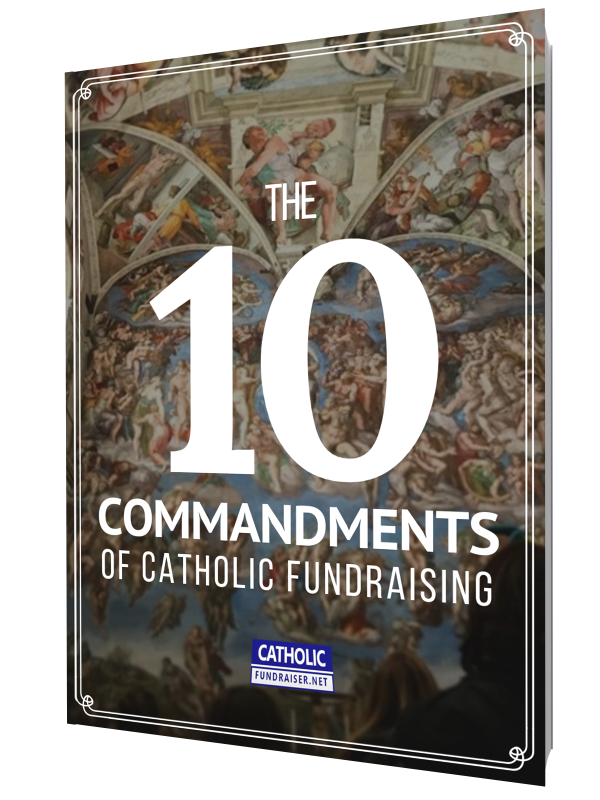 While reflecting on what has driven the success of the Catholic organizations I’ve helped with fundraising, I have come to recognize some common characteristics that I want to share with you. The organizations, religious orders, schools, or apostolates that keep the momentum going each week also raise the most funds. The habits and steps that they all share are simple and easy to repeat. It’s not some magic appeal letter or mysterious major donor that has made the difference. They are the difference! By showing up each day and consistently taking action with their fundraising, they have reached their funding targets and even exceeded them. In particular, I’ve seen three essential characteristics that can make the biggest impact. I recommend that, if you adopt the habit of applying all three, every week, then, you will get to where you want to go. At some point with your fundraising – or you may have already experienced this – you will struggle to find donors. Today is your lucky day. Because this article outlines exactly how you will never have to struggle again. In fact, in the next paragraphs, you will find ideas so good and practical that you can start applying them today and see immediate results. When it comes to your Catholic nonprofit or cause, you simply don’t have the time to waste struggling to find donors, so let’s find your next 10 donors today. First, I want you to take a step back and recognize that, even before you start looking for donors, you are probably juggling 100 other tasks that need to be done, plus another 100 hurdles getting in your way. What if we stop and consider a more Catholic approach? I use the term ‘Catholic approach’ because it’s not usually appropriate to ask anyone, especially strangers, for donations when they don’t even know who you are, wouldn’t you agree? Before he dove into his mission, which included asking for donations, he did two important first steps that we should replicate. First, he paused to reflect on what he was going to do, and then he checked that his apostles were clear about what the mission was. Before we run around asking for funds, we should do the same as Jesus. It’s important to start any campaign with first, checking that you’re clear with what you want to do and second, confirming those around you are clear about that, too. 1 – Start with a clarity of mission. Before you run off and look for supporters and funding, pause for a moment and get clear with exactly what your mission aims to accomplish. While you may think you’ve figured this out, you’d be surprised how unclear that might really be if you dig a bit deeper. Even Jesus took 40 days to prepare himself for his mission. He knew what awaited Him, but He also knew the importance of being spiritually, mentally, and physically prepared. I recommend that you pause, just as Jesus did, and take at least 40 hours to review your mission and your path to that goal. You could even take this time to fast. Reconnect yourself with God to make sure you are fully prepared to move forward. On the go? Download and listen to the audio version of the article. 2 – Make sure people know who you are. You should never assume that people know what it is that you do. Even if it looks obvious, people will always have questions. Like Jesus, you want to make sure that those who work or volunteer for you are equipped to clearly share your mission with people during a fundraising campaign. By getting those around you on the same page, you’ll save time and effort later, especially during gift requests, because you and your team will know how to answer these questions. When people know exactly what you do, and you clearly answer their questions, you both soothe their misgivings and encourage them to be more eager to support your mission. Taking ‘the Jesus approach’ to your fundraising. We all want to rush fundraising and get straight to work in the vineyard, but fundraising starts with a clear understanding of what you do and how those around you communicate it to during a campaign. Even Jesus, the Son of God, took time to do these two important steps. Consider taking the same approach as Jesus before you launch your next campaign. The result will be that you’ll have more confidence in both your work and your ability to communicate it to others. Question: What’s the first step you usually take when fundraising? You can leave a comment by clicking here. Let’s get serious because you wouldn’t be reading this if you were not looking for better ways to improve your fundraising. I want you to be successful and accomplish all you want with your mission. To do just that, I want you to take your fundraising to the professional level. But before we talk about professionalism, I want to put this word into context with our Catholic faith. When we often talk about professionalizing anything in the Catholic Church, we can quickly think of suits, flow charts, graphs, colorful brochures, policies, and procedures. That’s not what I am talking about here. When I say go ‘pro’ with your Catholic fundraising, I mean keeping your eyes on the bigger picture; Jesus Christ. I say this in all seriousness because there is a small but vital distinction to be made with your fundraising.